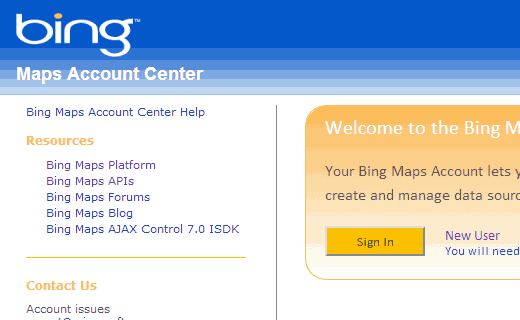 Recently one of our readers asked us if it was possible to add Bing maps in WordPress. We have already covered how to add Google maps in WordPress. However, if you like Bing maps better, then you can add them on your site. In this article, we will show you how to embed Bing maps in WordPress with and without using a plugin. First thing you need to do is go to Bing Maps and search for the location or map you want to embed. Once you have found the location, click on the Share button. 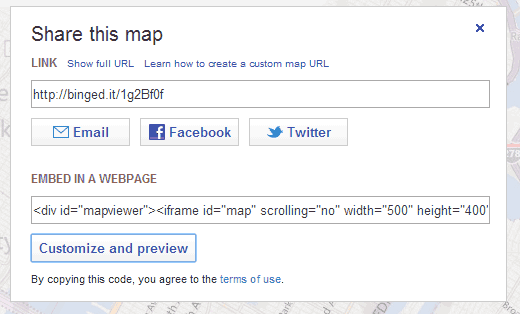 A popup would appear showing you a link to the map and an embed code, so you can add it to your web page. Below the embed code you will find a button Customize and Preview which will open a new window. On this window you can customize your map. 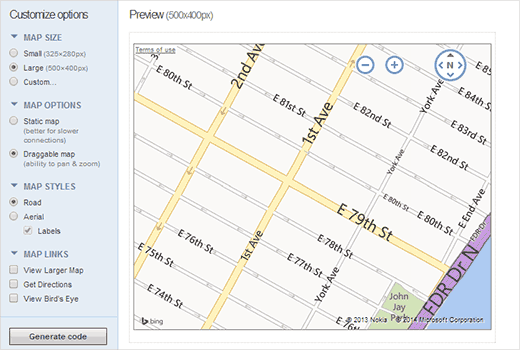 Choose a map size, show or hide links to bing maps, choose map type, etc. Once you are satisfied with the preview simply click on the Generate Code button. Your embed code will be displayed in popup window. You can now copy and paste this code inside your WordPress posts, pages, or in sidebar widgets. If you run a website where you often need to add maps, then using a plugin to add Bing maps would be easier. 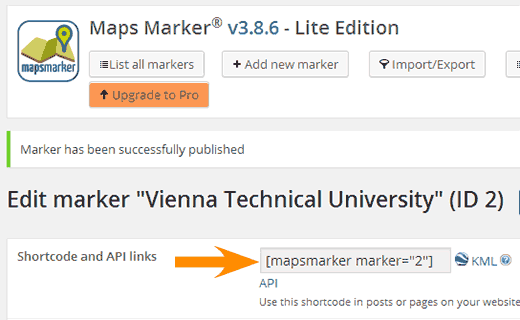 First thing you need to do is install and activate the Leaflet Maps Marker plugin. 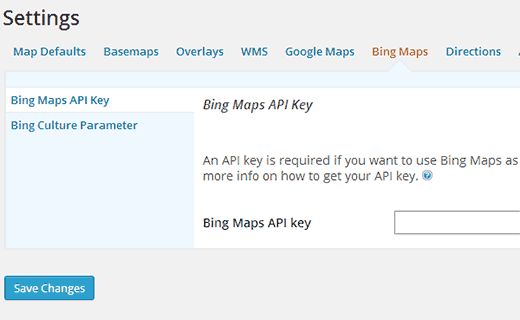 In order to use this plugin with Bing maps, you will need to have a Bing Map API Key. Simply create an account on Bing Maps Portal website. Once you have created an account, you need to click on ‘Create or View Keys’ from the left hand sidebar. On the next screen, you need to fill out your website information. 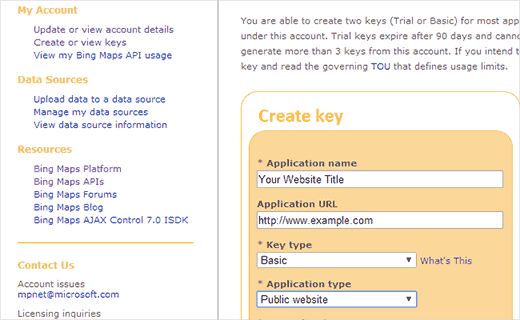 You can create two type of keys: Trial or Basic. A trial key will expire in 90 days. We recommend using the Basic key instead. However, keep in mind that there are certain limitations on the usage of Basic key as well. If your website is publicly accessible to any one, then you can use this key. In the application type, choose Public Website and submit your request. Your request will be processed and your key will be displayed at the bottom of the page. Now you need to copy this key and go to Maps Marker » Setting. Click on the Bing Maps tab and paste your API key there. By default the Leaflet Maps Marker plugin uses Google Maps, so you will need to explicitly instruct the plugin to use Bing Maps. This can be done by going to Maps Marker » Setting and click on the Map Defaults tab. Scroll down to ‘Default basemap’ section and select Bing Maps. You will notice that there are multiple entries for Bing Maps, like aerial view, roads view, etc. Choose the one that best suits your needs and click on the Save Changes button. To add a new Bing map to your site, you need to go to Maps Marker » Add New Marker, give your marker a name and set the map to your desired location. Leaflets Maps Marker plugin comes with powerful features allowing you to add different markers and layers to your map. Explore these options and once you are satisfied with the map hit Publish button. The plugin will now generate a shortcode for the map you just created. Copy this shortcode and paste it into your posts or pages. We hope this article helped you embed Bing maps on your WordPress site. For questions and feedback, please leave comments or join us on Twitter. 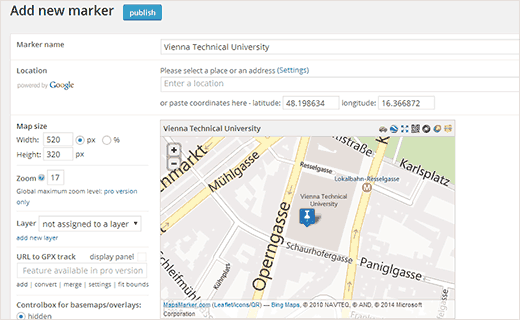 To leave a comment please visit How to Embed Bing Maps in WordPress on WPBeginner. Copyright (©) 2017 Boxx Media, Inc. All Rights Reserverd.